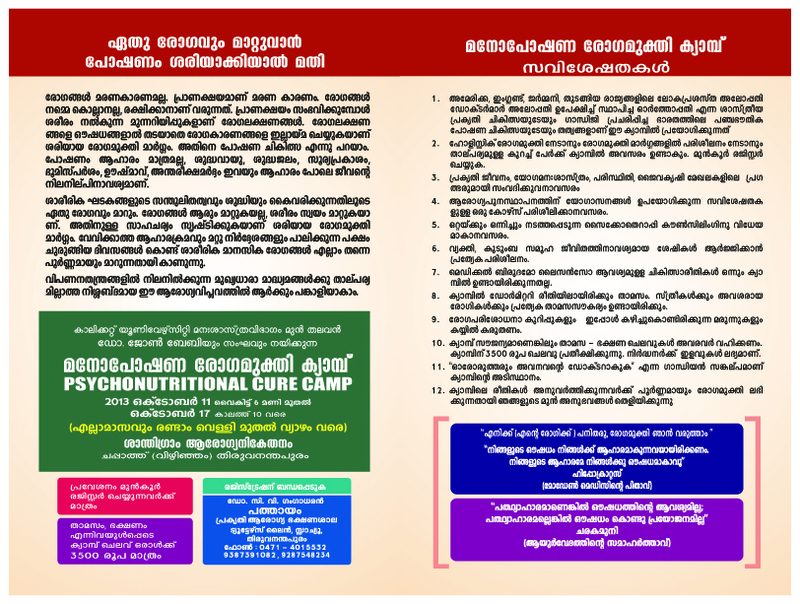 Santhigram Aarogyaniketanam (wellness center) is organizing Psycho Nutritional Cure Camp in collaboration with Natural Health Research Foundation, Thrissur. The camp will start on 12 (6 pm) and conclude on 16 (10 am) July. 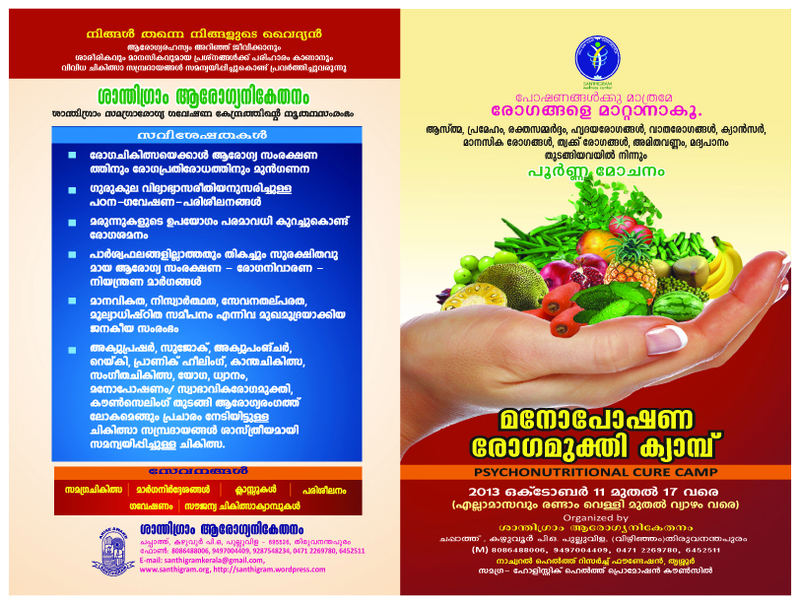 The programs will be conducted at Santhigram, Chappath (Near Vizhinjam). The participants will have to contribute an amount of Rs. 3500/- which is inclusive of boarding, lodging, and other incidental expenses. In the camp, methods including nutrition, rest, music, psychological counseling etc. will be used for healing. Dr. John Baby, Former Head, Department of Psychology, Calicut University will be the chief resource person and will be assisted by a team of holistic health care practitioners. The camp is intended for people with chronic diseases like Bronchial Asthma, diabetes, Blood pressure, Psycho somatic, Obesity, Addictions, Arthritis, Neuro muscular, Kidney & Heart, etc. The uniqueness of the camp is to cure these diseases with out the use of medicines of any kind. The admission is restricted to 20 persons on a first come first serve basis. (M) 8086488006, 9497004409, 0471-2269780, 6452511. Vizhinjam: Santhigram Wellness Center, the health division of Santhigram is organizing a three months certificate course on alternative health care which provides treatment without the use of medicines. The major contents of the course include Acupressure, Massage, Sujok, Yoga, Meditation and Counseling. The courses will start on May 1, 2013. Expert professionals will lead the sessions. The program will be held on holidays from 9am to 5pm. Those interested may contact on or before April 24. The interview will be held on April 26 at 10:00 AM. Mode of study: Contact Classes Eligibility: Std X with good physical and mental health. Certification: Santhigram’s certificate will be issued to those who successfully pass the examination and fulfilling the academic criteria’s. Yoga Meditation training for women & students will start from 15 to 25 April 2013 at Santhigram, Chappath (Near Vizhinjam) and inaugurated by Smt. Ramani P.Nair (President, District Panchayat) on 15.4.2013 at 10 am. Vizhinjam: “In order to have a sustainable health protection a people health movement is to be launched by the people and the government”, Former Health Minister V.M Sudheeran, the former Health Minister said. He was inaugurating the Arogyanikethan at Chappath. The facilitation Central Office of Santhigram, Jackfruit Promotion Council, Holistic Health Promotion Council namely the Swaraj Bhavan was inaugurated by Padmasree Sugathakumari and Padmasree K. Viswanadhan, the Director of Mitraniketan. Diseases are at an increase along with the increase of modern hospitals and treatment facilities. Former Health Minister V.M Sudheeran said new unknown diseases we are contracting through polluting our air, water and earth. Mental and physical diseases are at an increase due to the use of alcohol and other abusive substances. We have to have a people movement to save over children and women from alcohol – based crimes. Chairman, All India Gandhi Smarak Nidhi, P. Gopinadhan Nair, prof. R.V.G Menon, R.K Sundaram, Dr. V. Rajasenan Nair, Dr. V. Reghu, Dr. Mercy Muricken, Prof. T.S.N Pillai, P.M Dev, A. Saraswathy Bhai, R. Appukuttan, Payattuvila C. Retnakaran, C. Leela Bhai, the Santhigram mothers, Kamalamma, Reghupathi, Padmavathi and Sumangi were adored by ponnada in the Guruvandanam programme. P.T Mathew, President of Kerala Grama Panchayat Association was the chief guest and B. Sivakumar, President, Kottukal Grama Panchayat, V.V Ramachandran, Head, NHRM Social Development have facilitated. Dr. Ravi. M. Nair, Dr. Mricken, Dr. P.K jayarus, Dr. John baby, Dr. Shajikutty, Dr. Sunil Dhath, Yogacharya D. Sreekandan Nair, and Dr. V. Vijayakumar have presented various subjects in the health seminar based on the topic of ‘you are your own doctor’. Ajit Venniyoor, Johnson Joseph, Pushpam Vincent, Dr. T. Sundaresan, M.V Ramakrishnan, Rosario Elizabeth, Asuntha Mohan and Daniel Mobesh had participated in the fraternity meeting. The musical evening was blessed with Dr. T.K sanitha (Hindustani vocal), I. Vijayakumari & party. We are happy to share with you the glad news that Santhigram has completed a quarter of a century in the cause of equitable and sustainable development. This has been possible because of the valuable support provided by friends like you. As part of the Silver Jubilee celebrations, we are happy to dedicate to the public the SanthigramWellnessCenter, constructed with the support of Andheri Trust, Trichy and local friends and well-wishers. The WellnessCenter (Arogya Niketan) will function as the facilitation center for different Santhigram initiatives aimed at promoting holistic health, with focus on non-invasive, low-cost methods with no side effects. The function will start at 10. a.m. and end by 5 p.m.
You are cordially invited to bless the function with your esteemed presence and make it a success with your valuable participation. CONTRIBUTE TO THE SANTHIGRAM FUND. When I first saw this title SANTHIGRAM KERALA | A Gandhian Initiative for People& on google I just whent and bookmark it. Thanks for the tips shared on your own blog. Something also important I would like to talk about is that weight loss is not information on going on a dietary fad and trying to get rid of as much weight as you’re able in a few months. The most effective way to lose weight is by taking it bit by bit and obeying some basic guidelines which can assist you to make the most out of your attempt to shed weight. You may know and already be following some tips, but reinforcing know-how never affects. When I first saw this title SANTHIGRAM KERALA | A Gandhian Initiative for People& on google I just whent and bookmark it. Whats up. Very nice website!! Man .. Excellent .. Amazing .. I will bookmark your site and take the feeds also…I’m happy to find so much useful info here within the article. Thanks for sharing..
Wow, marvelous blog layout! How long have you been blogging for? you made blogging look easy. The overall look of your site is wonderful, let alone the content!. Thanks For Your article about SANTHIGRAM KERALA | A Gandhian Initiative for People& .